This brass plaque is a mystery. We do not know how or why it came to be on the south wall of the church here in East Grinstead, nor who manufactured it. It could be a later copy, or it could date from 1660. The little monument is described as an inscription ‘on a rectangular plate, 12¾ by 9in., in nine lines in Roman capitals, rather roughly engraved’. (C.E.D. Davidson-Houston, ‘Sussex Monumental Brasses’ in Sussex Archaeological Collections 78 (1937) 68-73). 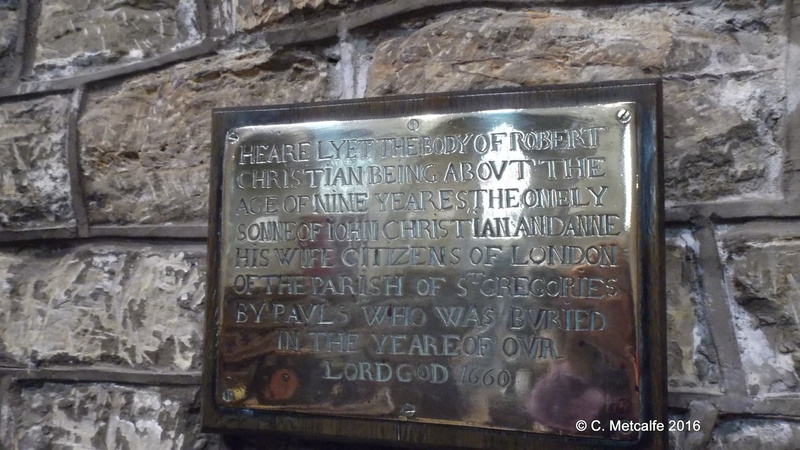 This sad monument in St Swithun’s church is to a boy of ‘about 9 years old’, the only son of John Christian and Anne, citizens of London, who was buried in the year 1660. We do not know if they had any daughters who survived. The parents were citizens of London of the parish of St Gregory by St Paul’s. The monument originally marked the burial place of the boy, but we do not know where he now lies. Was he buried in London, or in the churchyard at St Swithun’s? 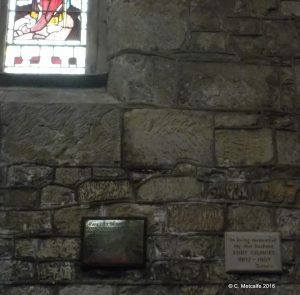 Was the plaque brought inside before the tower of St Swithun’s fell in 1684, and again in 1785? Was the plaque put on the South wall because someone remembered this family? Is this plaque a replacement of an earlier one? Why were a London family in East Grinstead in 1660. With the surname ‘Christian’, this family could have been Puritans. They may have been victims of the disruption caused between 1642 and 1660, with the period of brutal Civil War battles in Britain, the execution of King Charles I in 1649, then the rule of Parliament, latterly with Oliver Cromwell as Lord Protector. Monarchy was restored in England when King Charles II returned in 1660. Perhaps this family came out of London to East Grinstead for some reason. The parishioners spent a considerable sum on the fabric of the church: in 1641 the Journal of the House of Commons recorded that more than £1500 had been spent on beautifying the building ‘four years since’. By 1641, however, Inigo Jones had changed his mind, and began the demolition of St Gregory’s, ordering the parishioners to take down the remainder. Apparently, he threatened that if they did not take down the rest of it, ‘then the galleries should be sawed down and with screws the materials thrown down into the street.’ The complaint of the parishioners was eventually heard in the House of Lords. The Lords decided against Inigo Jones and the church was rebuilt using stones intended for the cathedral. The dangerous religious climate in London is shown when, in 1658, a minister of St Gregory’s, Dr John Hewitt, a Royalist, was executed for treason, on the orders of Cromwell’s government. He was beheaded on Tower Hill and buried in the church. These must have been confusing times for clergy and parishioners. Our Vicar’s board in St Swithun’s illustrates the confusion and frequent changes of clergy in our own parish in this period. 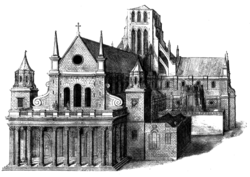 St Gregory’s was destroyed in the Great Fire, or the Fire of London, in 1666, along with St Paul’s cathedral. Like some other London parishes, St Gregory’s remained an adminitrative identity for some time, but the parish church was not rebuilt. 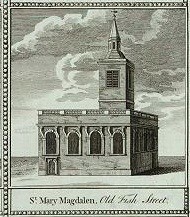 Instead, it was combined with St Mary Magdalen, Old Fish Street. John and Anne Christian did not know in 1660 that the Fire would destroy their former church in 1666. Is it possible that this monument to their son was somehow rescued from London and brought to St Swithun’s, after 1666? We lack specific information about the donors and makers of this sorrowful inscription ‘rather roughly engraved’ upon a small brass plate’, yet the plaque gives us a glimpse of a much loved boy, the turbulence of the Civil War and Commonwealth period, a link to the Great Fire of London and a church destroyed in that fire.